After releasing the exceedingly dreary ballad, “The Art of Letting Go” back in November (which was essentially radio poison), it seems that Mariah Carey has learned from her mistake and is going to attempt to win back the airwaves with the next offering from her upcoming 14th studio album. 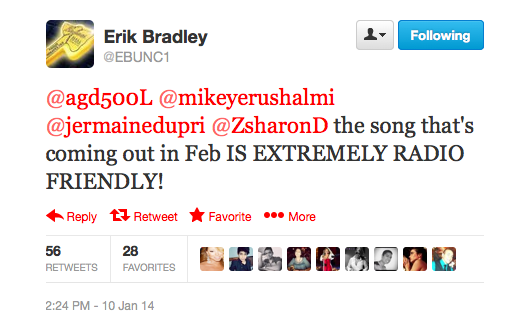 If Erik Bradley is to be believed (he works for Chicago radio station B96), Mariah’s next single, due in February, is “EXTREMELY RADIO FRIENDLY!” That’s music to my ears! The caps lock means that he’s sincere! We don’t have any concrete details about the track yet, but some fans (or Lambs, as Mariah lovers are affectionately known) are speculating that a couple of beats posted to Instagram by longtime Mimi collaborator Jermaine Dupri recently could be for her new project! Take a listen to the two possible Mariah instrumentals here and here. What do you think? Are you excited for Mariah’s next single?